None of these clothes are my own so I can't give details as yet, bare with me. I'm really excited to show you a couple of the pics taken last week when I did a shoot with Emma & Jenny who are students at the College Of Art in Leeds. We did quite a few sets but these are one of my favourites, it's just so different~ from the norm for me and I love it. I have quite a few other outfits to post so let me know if you'd like to see those and I can maybe post a set during the week along with my usual outfit pics. Today I braved the crazed shoppers and picked up the last little presents I needed. Town was manic even for a Monday afternoon. I dread to think what Saturday will be like! Thankfully I managed to get everything I wanted, and I even ended up buying presents for myself from my boyfriend. Does anyone else do this? It actually doesn't bother me, but I can see it bothering some. At least I get what I want. I am SO excited to be going home for Christmas tomorrow! I've literally been counting down the weeks and finally I feel like I can get excited about this weekend. It just doesn't feel like Christmas unless i'm with my parents and I’m certainly not ready for one without them just yet. I'll be home for a week and i'm pretty sure it'll be filled with fun and lolz! 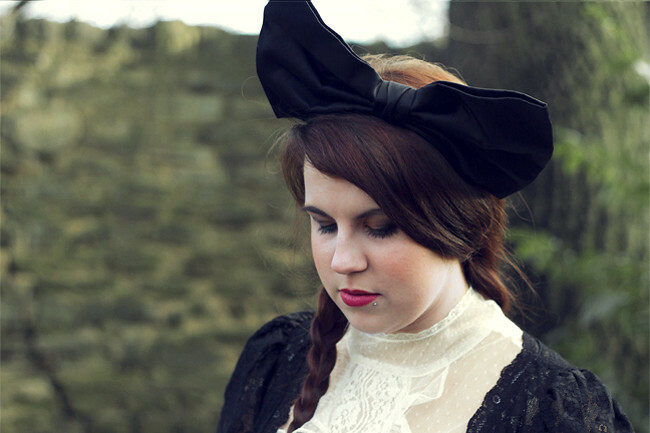 Thanks so much for all your lovely comments/tweets RE my video! I was really nervous about it but I’m so happy you like it and it's definitely made me want to film more. I'm thinking of doing a vlog type one this week when i'm home but we'll see if that actually works out! I'm going on my Mums car insurance so some days trips are in order over this week and hopefully some different kinda outfit pics. There's another blogging comp coming up (I know, just as we all get over Cosmo) and i'd be thrilled if you like my blog enough to enter me. Just click here to do so and thank you so much to anyone who does vote for me! Just a heads up for those still wanting to enter my giveaway, it ends on Wednesday! You look amazing, you have a lush figure! Love the pictures, you look gorgeous! Gosh I'm trying to stay away from shopping in Leeds....can't stand the rush! You look adoreably badass here! its so cute. 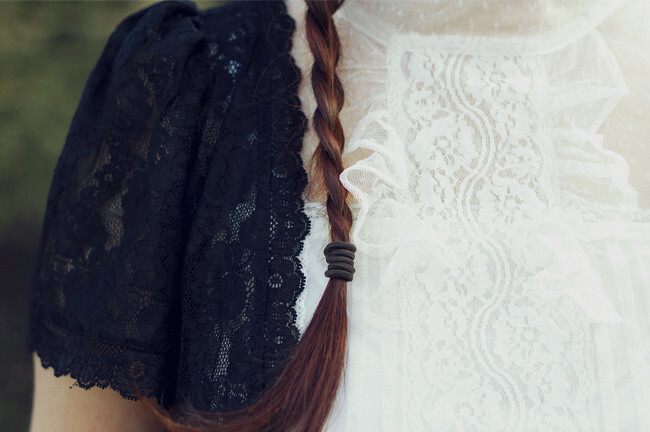 love the bow and the pleat and the lace definite winner! SUCH a cute outfit! and i LOVE the oversized bow! Perfect! So amazing, you look really gorgeous! 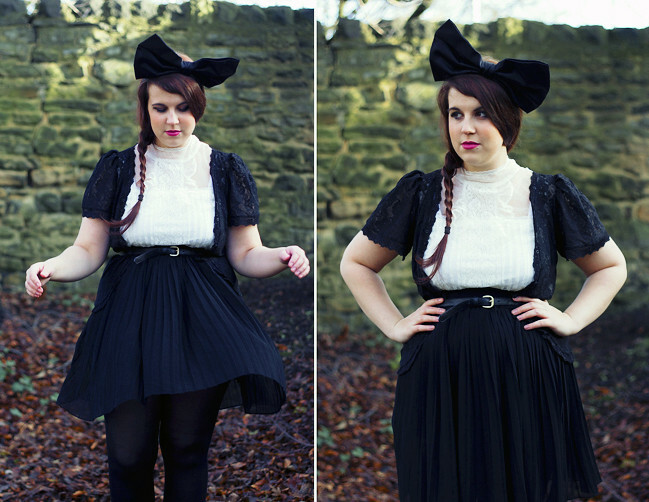 These are beautiful photos, love the massive bow and the lovely pleated skirt! I do the thing of buying presents for myself all the time - I'd much rather know I'm going to like what I get than have to pretend I like something I don't (and for the poor person to have wasted their money!). I love the color of that lipstick against the black/white combo ( my fav. color combination may I add). Where can I get it from? i'm working saturday in leeds too :( dreading it! Love this outfit so much! You look lovely! Loving this outfit. It's like a kooky Victorian girl. So cute.